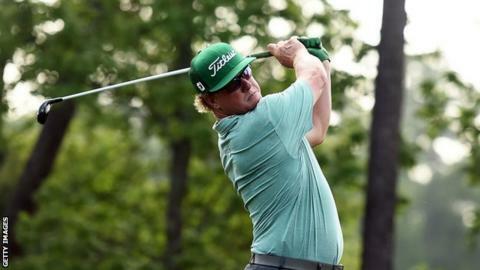 American Charley Hoffman holds a one-shot lead at the Houston Open after an eight-under-par opening round of 64. Hoffman, 39, birdied nine holes including five on the back nine, but bogeyed the 16th to finish one stroke shy of the course record in Texas. Compatriots Dustin Johnson, Roberto Castro, Scott Brown and Morgan Hoffmann are tied for second after rounds of 65. Jordan Spieth is two shots further back on five under, with Scotland's Martin Laird one behind the world number two. Phil Mickelson and Rickie Fowler are on three under alongside Ryder Cup star Jamie Donaldson of Wales and England's Greg Owen. Rory McIlroy and world number one Jason Day are both missing the Houston Open, preferring to prepare for next week's Masters at Augusta away from tournament action.